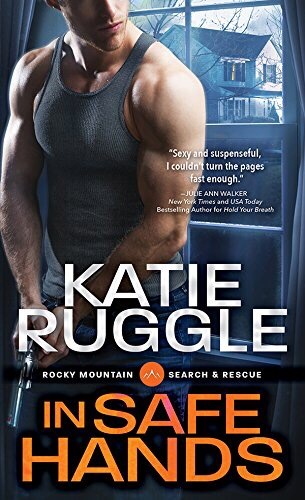 In Safe Hands is the fourth and final book in Katie Ruggle’s Search and Rescue series. Chris Jennings is a deputy in the Field County Sheriff’s department. We’ve met Chris earlier in this series, investigating the various murders and crimes committed in this small burg. His childhood friend Daisy, in the middle of the night through the window of her home, see’s what she thinks is a dead body being carted out of the vacant house across the street. She calls in her friend Chris and the investigation begins. Katie Ruggle has quickly become one of my favorite authors. Her characters are not your average boy or girl next door. They are all very unique, and in these stories it’s the women who are more flawed than the men. Daisy, is agoraphobic. She hasn’t left her home since she witnessed her mother’s murder at the age of 16. Chris was the first officer on the scene, a young deputy who blames himself for her mother’s death. She blames herself. The window of her home is her television. Her neighbors are her entertainment, but then things start to happen, in a very Rear Window, Hitchcockian manner. I was fascinated with the intricacy of this mystery, which has spanned all four books. I was enthralled by the characters, their humor, emotions, and integrity. Even though all of these characters have problems they have to overcome, they eventually find their way out of the depths of their despair. They make friendships, fall in love, and start to see what living a full life is all about. The wrap up to this mystery had a great conclusion, leaving the reader fulfilled, and the love story between Chris and Daisy was sweet and wonderful. I am sad to see the end of this series, but excited to have found a very talented writer to follow, read and collect, for many years to come. I was given a copy of this book through the publisher, Sourcebooks Casablanca, through NetGalley, for my honest review.